Open Ministry grants Honorary Titles upon request; our Ministry has no hierarchical structure, titles of position and authority are available for independent ministers, churches and ministries. 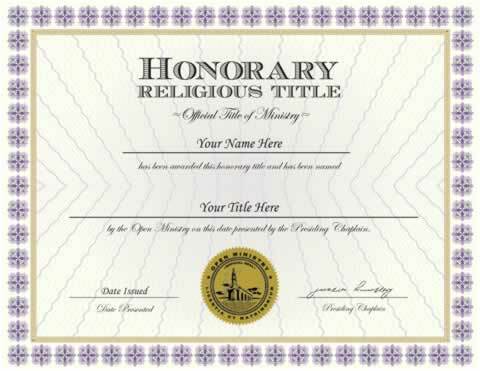 The Honorary Title is custom made with your name, date of Ordination and date of bestowal. Included is our gold embossed Ministry Seal. There is no limit to the number of Honorary Titles you can request. 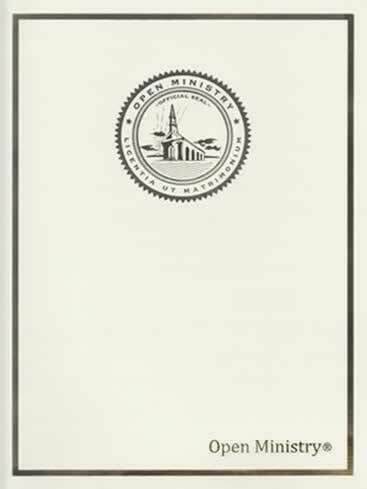 Proudly display your ministry title and honorary status with this official church document. Printed on high quality traditional parchment enhanced with gold foil braided border, metallic ink flowering and starburst design in center. Suitable for framing and display. NOTE: Requesting this Title will not change how your name is displayed in your minister account or on other credentials you request. Honorary Title is also included in some of our packages. Thank you for having high quality material and speedy delivery. Great service! Hi Open Ministry, I would like to say I Thank You I Thank You and I Thank You. Awesome job looks Great, Excellent, and Professional. I am very Pleased with everything that we have ordered. Keep up the Great work Open Ministry. We would just like to say We Thank You, We Thank You and We Thanks You for the Awesome Work that Open Ministry are doing. Everything looks Great, Professional and Excellent! Keep up the Great work Open Ministry. The material with the title and sent cards are perfect: however, still waiting for your answer about the value of your securities issued. your service is very fast and very good. The document Colonel came regularly to my home: everything perfect. Sorry but it`s really cheap and cheesy. And it came all wrinkled. It was to messed up to put on wall. Since it was so wrinkled I through it out. It is what it is. We are sorry to hear that your title was damaged in the mail. Please contact us via our help and support center for assistance.